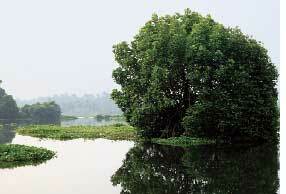 THE island of Valanthakad in the suburbs of Ernakulam has one of the largest mangroves in Kerala spread over 644 hectares (ha). If things go according to the state industries departments plans, the mangrove will give way to a hi-tech city. A private developer has acquired 129 ha from farmers on the island to build a knowledge park, commercial complex and star hotels. The project is awaiting the approval of the single window clearance committee set up recently to speed up mega-projects, including the one by Sobha Developers. The Kerala State Biodiversity Board (ksbb) has asked the chief minister who heads the clearance committee to reject the project. The kssb has prepared a note saying the project violates state, national and international laws. These include coastal regulations and laws to conserve paddy fields and wetlands.The land purchased by the developer under 18 companies to sidestep land reforms act, is also a violation of the law, kssb said. Valanthakad is part of the Vembanad backwaters, one of the sites covered by the international treaty for wetland conservation, the Ramsar Convention. Any development activity will be disastrous for the ecology and a violation of the treaty, said Purushan Eloor, activist and a member of the non-profit, Paristhithi Samrakshana Koottayma. The kssb note said it would be impossible to recreate the mangrove elsewhere; science has not grown for such a feat. The board points out that the ecological services provided by the ecosystem are worth Rs 77.28 crores a year. This amount is the gross value of the 14 ecosystem services provided by the mangrove and wetlands, said V S Vijayan, chairman of kssb. The state government is pressing ahead with its plans. State industries minister, Elamaram Kareem, told media persons that the hi-tech city would provide jobs to 75,000 people. He said relaxation in the existing rules would be enough to clear the way for development. Vijayan said there is no point in having acts and laws if they are to be bypassed. He said the project is meant to profit a few individuals and is not for the larger public good.